Chau Van is a highly rhythmic form of singing that often accompanies “hau dong” (mediumship) during rituals to honor the Mother Goddess or connect to other gods. It is usually performed in temples and pagodas. The music and poetry performed in this folk art are blended with a variety of rhythms, pauses, tempos, stresses, and pitches. The genre originated in the Northern Delta region of Vietnam. The main musical instruments used in the genre are the Dan Nguyet or moon-shaped lute, and a set of phach, wooden sticks beaten together against a hollow bamboo. Unlike Ca tru or ceremonial singing, Chầu văn is not adapted from daily life ceremonies but associated with Shamanism, a type of soul possession practiced in primitive times. Chau Van was born out of people’s worship of saints, genies, divinities and heroes of legend who aided the national construction process or processed a magic power that could save people from natural disasters or diseases. According to Professor Thao Giang, Deputy Director of the Vietnam Musicians Association and a traditional music researcher, Chau van began in the 16th century in the Le Dynasty. “The lyrics of an ancient Chau van song mention the Le Dynasty. No one knows exactly when Chau van was born but from that lyric we can guess. The class hierarchy in Viet feudal society influenced the system of worship in Chầu văn,” Giang noted. Thanks to the habit of worship that began in ancient times, temples were built in many localities. At each temple honoring a hero or a god, people gathered annually to recite derotional poems based on a folk phrasing of six-eight or five-seven meter. Over time, a genre was formed. Chầu văn is the combination of ritual customs of the Mother Goddess, worship habits, legends, and traditional music techniques. Many features of the Northern Delta region of Vietnam, from oratorio rituals in temples and pagodas to costumes and cuisine were incorporated into the genre. Sometimes, a Chau van singing contest between two villages is held to choose the best singer. In Chầu văn, a singer is called Cung văn. Accompaning him is a ‘hầu đồng’ or medium, who modestly calls himself a channel through which the gods may appear. The lyrics of a chầu văn song is usually a section of a legend which praises the merits of the gods. The characters worshiped can be a king, a hero, or just a farmer. Each performance can last up to 4 hours and worship 8 to 12 different characters. To start the show, performers purify the air, using a big fire to sweep away evil spirits. “All heroes, princes, princesses must follow the rule as well. It’s part of the ritul. When the turban is placed on the medium’s head, shadowing his face, the soul leaves. At that time, the drum is frantically beaten to welcome another saint. The medium is not himself anymore” Giang added. When a saint appears, the singer must tell who he is, where he’s from, what he has done to be worshiped, and how close he is to local people. Dancing and brandishing sometimes appear in Chau van as well. Since the people who are worshiped all have great virtues, whenever they take part in a performance, singers must forget who they really are and act like saints. It is said that Chau van can change people’s behavior and make them more patient and soft. People lose bad habits such as a short temper and perform better at school or work. Chau van’s popularity has spread throughout Vietnam’s central and southern provinces. Recently, the Vietnamese Cultural Study Institue and the Vietnamese Folklore Art Association have collaborated with the Finnish, a non-government organization called Juminkeko saatio, through a project called ”The Bridge of Cutural Traditions” is promoting traditional oral music in Vietnam. 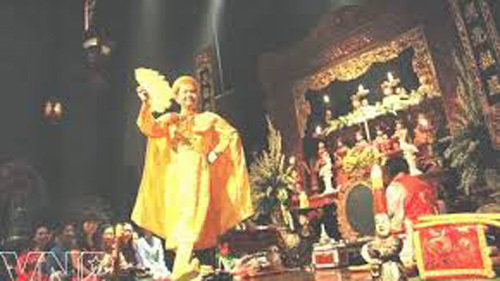 A number of festival promoting Chau van have been held in or near Hanoi, and a dossier on Chau Van will be submitted to the Ministry of Culture, Sports and Tourism to request recognition of the genre as a national intangible cultural heritage, and submitted to UNESCO for recognition as an intangible cultural heritage of mankind.